~Has taught privately for over 15 years, beginning—college levels. Having early training in the Suzuki method, Dr. Hofer developed a strong sense of musicianship and won several competitions at a young age including the Orange County Youth Orchestra Concerto Competition. Under the tutelage of Mischa Lefkowitz of the Los Angeles Philharmonic, he was a finalist in the Music Teachers Association of Californiaís Young Artist Guild Competition, received the Marilyn L. Crandon Merit Scholarship, and at age 16 was accepted to Juilliardís International Summer Music Academy at the Hochschule fur Musik und Theatre in Leipzig, Germany. Dr. Hofer completed a Bachelor of Music degree in violin performance and a Master of Music degree in violin performance and pedagogy at the Peabody Conservatory of Johns Hopkins University in Baltimore, Maryland, where he studied with the acclaimed chamber musician and violinist Violaine Melancon. While at Peabody Mr. Hofer was awarded the J.C. Van Hulsteyn Award in Strings: Violin, the Peabody Career Development Grant, and the Lime Kiln Foundation Scholarship. He recently completed his Doctor of Musical Arts degree in violin performance at the University of Utah where he was the recipient of a Music Scholarship, held a teaching assistantship, and studied privately with Dr. Hasse Borup. Dr. Hofer has performed in Masterclasses for Renaud Capucon, Nina Beilina, Peter Marsh, James Stern, Aaron Berofsky, and Laurent Weibel, and has received personal instruction from such great artists as Stephen Clapp, Charles Castleman, Jiri Hurnik, Felicia Moye, Jeff Thayer, and Kevork Mardorossian. Dr. Hofer has years of experience in orchestral performance and leadership, and has served as Concertmaster of the Utah Philharmonia, the Loudoun Symphony, The Peabody Concert Orchestra, and the Orange County Youth Symphony Orchestra. Dr. Hofer has also been a member of the York Symphony, the Peabody Symphony Orchestra, the Round Top Festival Orchestra, Musicians of Mercy Orchestra, and the San Diego Civic Youth Orchestra, and currently performs as a member of Sinfonia Salt Lake—Salt Lake City’s premier chamber orchestra. Dr. Hofer has received orchestral instruction from Herbert Greenberg, Igor Yuzefovich, Mischa Lefkowitz, Yumi Cho, and Gregory Fulkerson, and has performed under the batons of conductors Gustav Meyer, Leon Fleischer, Christoph Campestrini, Mark Allen McCoy, John Koshak, Ken Lam, Tong Chen, Vladimir Kulenovic, Haijime Teri-Murai, Ed Polochick, and Robert Baldwin. Chamber music has always been an important part of Dr. Hofer’s career. 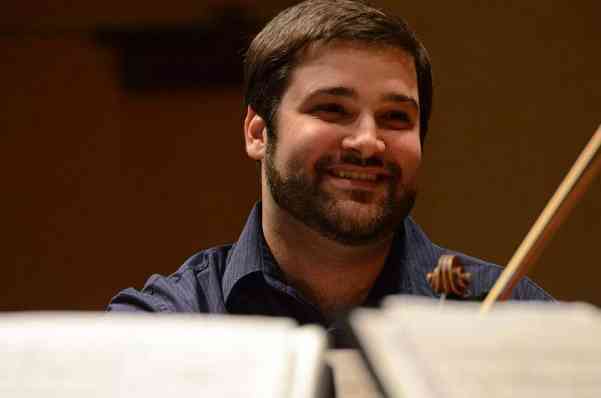 He is a founding member of and currently performs with the Rosco String Quartet. As a member of the Rosco String Quartet, Dr. Hofer won first place in the MTNA National Chamber Music Competition, was a finalist in the American Prize Competition, and was a Young Artist in Residence for the NOVA chamber music series. Also with the Rosco String Quartet Dr. Hofer was invited to participate in the Robert Mann String Quartet Institute, the Muir Quartet and Utah Symphony’s Emerging Quartets and Composers Program at the Deer Valley Festival, and the Juilliard String Quartet Seminar in New York City. As a chamber musician, Dr. Hofer has performed for the “Highway 89″ radio series for Classical 89 Radio, the Candle Light Concert Series outreach program based in Colombia, MD, the St. Charles String Quartet, the SONAR Ensemble, the Utah Museum of Fine Arts Chamber Series, and many other community and outreach performances. He also supports the performance of new compositions and has performed with the University of Utah New Music Ensemble and the Salty Cricket Composer’s Collective. Dr. Hofer has premiered chamber works of contemporary composers including Christopher Theofanidis, Eric Stewart, Harahito Miyahi, Nethaniel Eschler, John Shelby, Kevin Clark, Cory Kaspczyk, and Doug Buchannen. He has been coached by some of the world’s greatest chamber musicians including members of the Juilliard, Emerson, Muir, Takacs, Brentano, Miro, Biava, Elias, Bennewitz, Fry Street, Miami, Mendelssohn, and Doric String Quartets, the Garth Newel Piano Quartet, the Peabody and Pirastri Trios, as well as pianists Bruce Brubaker and Robert Merfield. As a violin instructor, Jakob Hofer is sought after by students of all ages, and is currently on faculty at Utah Valley University and the Gifted Music School in Salt Lake City. He was personally asked by Director Eugene Watanabe to organize an early childhood curriculum for young violinists ages 3 to 4 at the Gifted Music School. Dr. Hofer received his pedagogical training from Rebecca Henry and Laura Parker through the pedagogy program at the Peabody Institute. He studied psychology of music teaching with Harlan Parker, music theory pedagogy with Kip Wile, and furthered his pedagogical studies with Hasse Borup at the University of Utah. Dr. Hofer has been a violin instructor at the Olenka School of Music, the Bel Air School of Music and Dance, the Baltimore Suzuki String Orchestra camp at the Garrison Forest School, and the Greater Baltimore Youth Orchestraís Bridges program. He has successfully taught countless students at every age and level. He is a registered member of the Suzuki Association of the Americas, and has completed Suzuki teacher training workshops. Dr. Hofer incorporates philosophies of Shinichi Suzuki, Paul Rolland, and Mimi Zweig in his early training methods, and follows the methodology of Ivan Galamian and Carl Flesch for advanced students. Mr. Hofer’s violin is a 1956 Nicholas Vasich, and his bow is by David Samuels. He resides in Salt Lake City with his wife, Laurel Hofer, who is an accomplished vocalist and composer.